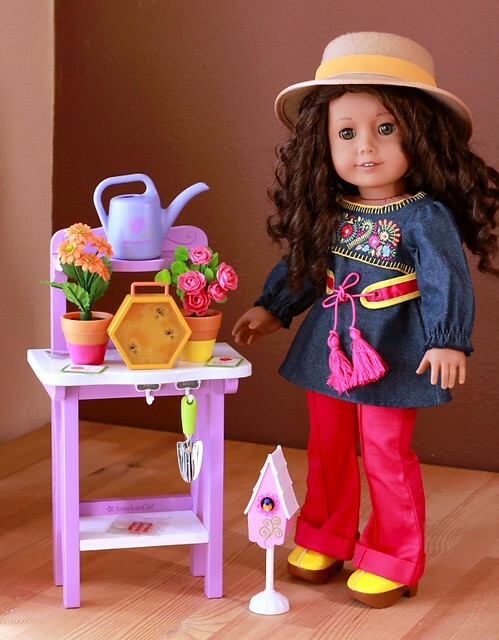 American Girl did it again with their Spring 2015 new releases. By “did it again”, I mean “reached into my dolly fund and sucked it dry”. I continue to be surprised by the things the clever designers at AG come up with and by my inability to resist the temptation to collect it all. I have a huge backyard garden. Every February, I get super jazzed for the upcoming growing season. In April, I buy seeds, I prep the beds, I lovingly nurture seedlings in my kitchen window. Mother’s Day is planting day, and after an exhausting eight hours or so, I stand back and admire my hard work. Initially, I am very enthused about my garden, plucking every weed the moment the dastardly beasts poke their heads above soil, hand watering the seedlings, whispering sweet words of encouragement to every bud. My dedication and devotion to my garden lasts, on average… two weeks. By June, I’m thoroughly bored with it. By July, it’s a weed infested jungle. In August, you need a machete to hack your way through to the enormous overgrown zucchinis. You can imagine my delight when the Sunshine Gardening Bench was revealed. Finally, plants I can fail to water without guilt! 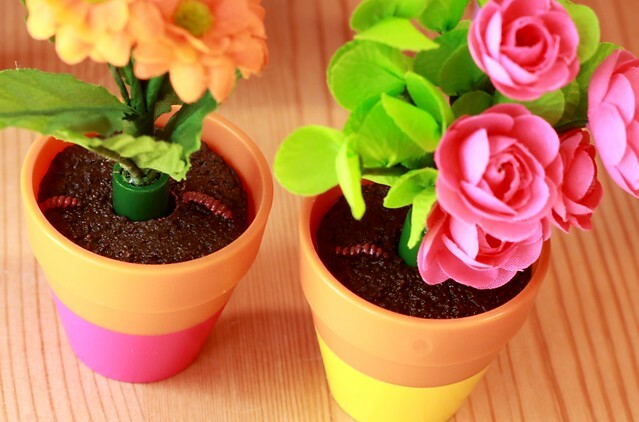 Bees that don’t sting and earth worms that aren’t slimy! And I’m a sucker for anything doll sized that mirrors my own interests (narcissist much?). Had American Girl offered free shipping year round, I would have purchased this set on release day, but at the retail price of $68, I hesitated. I’m glad I did, because less then a month later, the bench went on sale for 20% off PLUS free shipping. Sold! I made a review video if you’d like to see each piece in depth. It’s a little long at nearly 11 minutes because blah, blah, blah. Overall, I’m really pleased with the Sunshine Gardening Bench, particularly at the sale price with free shipping. It’s a unique set that is well made and has a ton of play value for 8 year olds and 40 year olds alike. 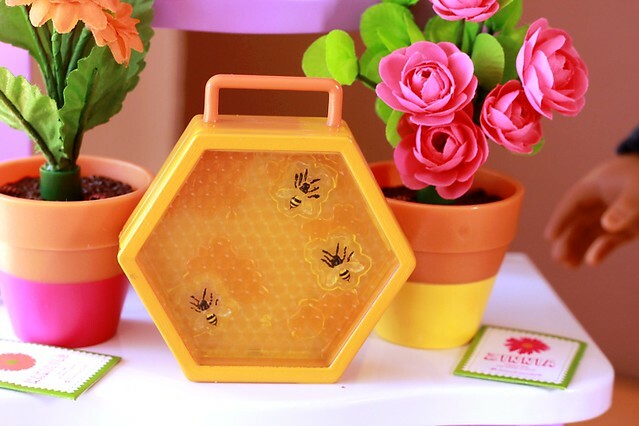 I like the interactivity of the potted plants and the beehive case. It photographs beautifully and it doesn’t require excessive storage space. I didn’t purchase the corresponding Sunshine Garden Outfit, although I’d consider it if it shows up on clearance someday. What do you think about the Sunshine Gardening Bench? Did the spring release zap your doll savings or leave you cold? 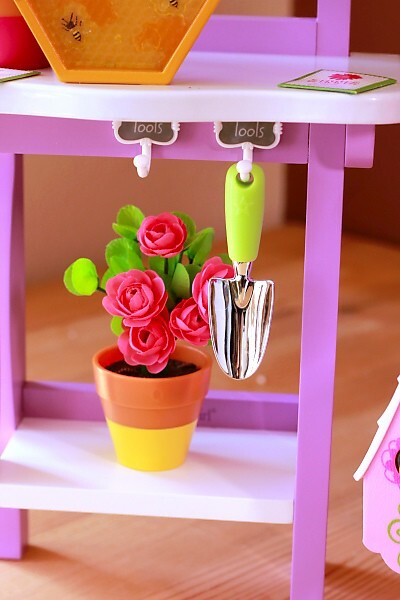 Along with the Gardening Bench, I purchased a few new things for Julie which will be in the next review post. In the meantime, I’m going to spend my weekend planning the 2015 garden I will summarily abandon tenderly nurture in the upcoming months. 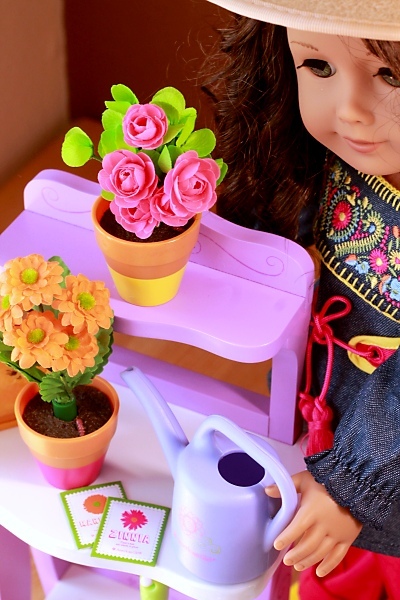 This entry was posted in Doll Review, Doll Video and tagged 18" Dolls, American Girl Dolls, Doll Review, Doll Video.